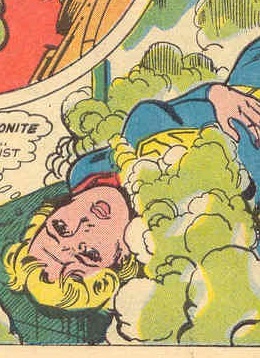 Supergirl is captured in a kryptonite cage by Braniac (flown by a flying saucer, or UFO), and is then forced to breathe kryptonite gas! She is able to escape because the cage bars are too big. Love the last panal. But I will imagine her being put to sleep than killed. @eriepatrick : She needs to fall into a deep sleep and then be bound and gagged in that cage.